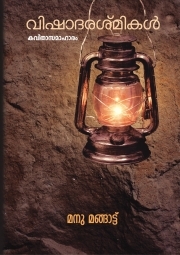 Description of "Vishaadarashmikal (Sparks of Melancholy- Malayalam)"
Vishaadarashmikal is a poetry collection by the Malayalam poet Manu Mangattu, listing 27 poems . The anthology documents the poet's tryst with maladies and madness, melancholy and sadness in a lucid and richly evocative poetic style. An ardent disciple of the Malayalam Romantic poetry tradition, Manu Mangattu, through the anthology, pays rich tribute to Changampuzha Krishna Pillai and Edappally Raghavan Pillai, the Keats and Shelley of Malayalam poetry. The brooding melancholy that envelops much of the anthology is a testimony to the Romantic convictions and predilections of the poet. Neither is the poet averse to experimentations and innovations as is evidenced by some of the last poems in the anthology. "Sachinaanandam", a long narrative poem on Sachin Tendulkar, deserves special mention in this regard. Manu Mangattu is an Assistant Professor in English from Kerala, India. Born on 21st of December 1985, he imbibed his penchant for poetry and flair for writing from his parents. He completed his post-graduation in English Language and Literature from Mahatma Gandhi University Kottayam securing second rank and a career as a litterateur. Soon he joined the Department of English, St George’s College Aruvithura where he has been imparting lessons in English literature ever since. Besides translations into English from Chinese and Sanskrit, he writes poetry both in English and Malayalam. His active involvement in Chinese poetry translations won him the sobriquet "Comrade to Poetry China" in 2016. A ‘brooding romanticist in poetry, a doubtful debutant in fiction and a morbid classicist in criticism’ Manu Mangattu is the chief editor of Aesthetique Journal for International Literary Enterprises (AJILE) and is on the editorial board of Spring Magazine. Currently he is working on a UGC funded research project on “Sachin Tendulkar as an Aesthetic Experience". He spearheads the activities at www.mutemelodist.com, a website catering to the creative aspirations of budding writers. Reviews of "Vishaadarashmikal (Sparks of Melancholy- Malayalam)"